Bundesliga | Which Bundesliga teams will join Bayern Munich and Schalke in next season's UEFA Champions League? 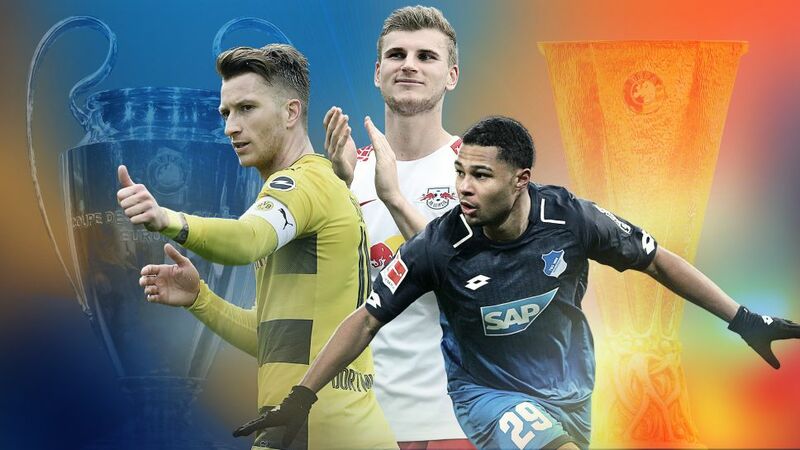 Borussia Dortmund's Marco Reus (l.), RB Leipzig's Timo Werner (c.) and Hoffenheim's Serge Gnabry (r.) are all in a fight for European football next season that is set to go down to the wire in the Bundesliga. Which Bundesliga teams will join Bayern Munich and Schalke in next season's UEFA Champions League? Matchday 33's home defeat to Mainz means Dortmund fans have been left sweating a little more over a top-four finish, but Borussia do at least have their fate in their own hands: on the season's final day they travel to fourth-placed Hoffenheim in what will surely be a final-day thriller. Avoid defeat or win and third is theirs, while defeat by two goals or more would see Hoffenheim pip them at the last. If they do end up falling behind the Sinsheim club, it would require a seven-goal swing in Leverkusen's favour to leave BVB outside the top four. That seems unlikely, but anything can happen in the Bundesliga, especially on the final day. Watch: Dortmund's revitalised attack with Marco Reus! While Michy Batshuayi made a fine start to life at Dortmund with nine goals in 14 appearances, he will not feature again this term. In his absence, Reus remains the team's standout attacker, having scored six goals in nine Bundesliga outings since his return from injury. After a flat performance against Mainz, coach Peter Stöger will be praying that the talismanic forward can help his boyhood club reach the Champions League for the seventh time in eight seasons. Under the new UEFA competition format, Hoffenheim wouldn't have required a play-off with Champions League finalists Liverpool at the start of this season, but Julian Nagelsmann's men are still very much in the hunt for a return to Europe after a rather underwhelming Europa League campaign. Defeat to Stuttgart on Matchday 33 hasn't helped, but, like Dortmund, Hoffenheim also have their fate in their own hands. Simply win against BVB on Matchday 34 and they will stay ahead of fifth-placed Leverkusen, who are level on points with TSG but must win handsomely at home to Hannover, or hope for a Hoffenheim slip-up, to take their place in next season's Champions League. Serge Gnabry looked to be Hoffenheim's leading light in the season run-in, the Bayern Munich loanee scoring seven and assisting three prior to sustaining a thigh injury against Hannover on Matchday 31. In his absence, step forward Kramaric, who has also been on fire in 2018. The Croatia international scored in five games in a row between Matchdays 21 and 25, notched a hat-trick against Hannover and has 12 league goals to his name this season, plus seven assists. He will be the side's key attacking weapon against Dortmund. Since successive 4-1 wins away at Leipzig and at home to Eintracht Frankfurt, the wheels have come off for Leverkusen at precisely the wrong time. Dumped out of the DFB Cup after a 6-2 home loss to Bayern, they lost heavily at top-four rivals Dortmund, slipped to a shock defeat at home to Stuttgart and could only manage a draw at Bremen on Matchday 33. They must now better Hoffenheim's result against Dortmund, or hope that goal difference falls in their favour in the event that both sides win. Dortmund can still drop out of the top four and Leverkusen can finish as high as third, but that seems improbable. The Jamaica winger has been one of the Bundesliga's standout performers this season, and his nine goals and six assists have played a huge part in Leverkusen being where they are. Having scored a brace in the 4-4 draw away at Hannover in December, he will be hoping for another fruitful afternoon against the Lower Saxons. His team need him to deliver on the final day. It was always going to be tough for Leipzig to repeat their sensational exploits of last season – when they finished runners-up to Bayern in their maiden Bundesliga campaign – but Ralph Hasenhüttl's men have so far avoided the dreaded second season syndrome. In fact, given the added demands of European football, they have perhaps exceeded expectations in 2017/18 and a Europa League spot would constitute a successful campaign. The easterners can still finish fourth, but must win against Hertha Berlin and hope Hoffenheim and Leverkusen lose. With Timo Werner, Youssuf Poulsen and Jean-Kevin Augustin for competition, the impression that English striker Ademola Lookman has made since joining Leipzig on loan in January has been sensational. Apparently not needed at his parent club Everton, Lookman scored the winner at Borussia Mönchengladbach on his league debut, notched at Bremen on Matchday 30 and hit another two in the 4-1 win against Wolfsburg on Matchday 33. For what could be his final appearance for the club, Lookman appears to be their most-in form player. The Eagles retain a mathematical chance of finishing fourth, but it is near enough non-existent. They must win away at second-placed Schalke and hope that Hoffenheim, Leverkusen and Leipzig all lose, and even then, Niko Kovac's men can only claim the final Champions League spot with the aid of a 15-goal swing on Hoffenheim. The upcoming DFB Cup final against Bayern on Saturday 19 May may be at the forefront of their minds, but Frankfurt would do well to aim for as good a result at Schalke as they can, with seventh spot providing Europa League football next season, even if they lose the Cup final to Bayern. However, defeat to Schalke could see them pipped to seventh by Stuttgart or Gladbach, after which defeat in the final would leave them with no European football at all next season. The former Ghana international insisted that, with a little more application, he might have played for Real Madrid. A bold statement, perhaps, but there is no denying the 31-year-old's immense talent, which he has been putting to good use since arriving in Frankfurt last summer. As well as contributing six goals and an assist, the experienced Boateng has been a key influence on a dressing room full of young faces, and will surely have some words of wisdom to impart ahead of the home straight. Click here for a closer look at the Bundesliga table!